Elsewhere on the ship Finn is sneaking through the engine room toward an escape pod. There he stumbles upon a young woman who is crying as she clutches what looks to be the other half of a necklace worn by the buyer we see die in the opening scene of the movie. We learn that she’s there to stun people who are deserting. She quickly figures out that’s what Finn is trying to do and stuns him. She must be held in some extremely high regard by Resistance leadership as she is there alone with no one to stop her from running should she choose to. After Finn comes back to consciousness he explains to her that they’ve been tracked through hyperspace. This sparks a conversation as to how the First Order could possibly have done this previously impossible feat. Within about 30 seconds they offhandedly mention something that would work and not only figure out how the First Order did it but what they’d need to do to undo it so that the Resistance could escape. Petty Officer Third Class: Hey, did you hear that the enemy was able to destroy up our aircraft carrier by going back in time and blowing up the shipyard it before it was even built. 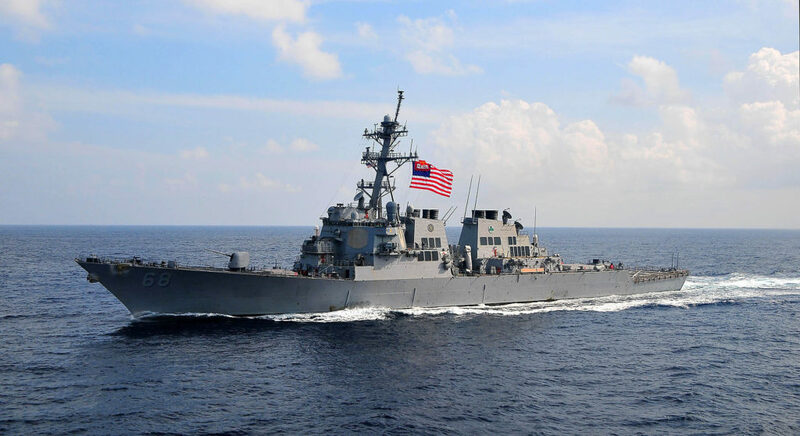 Petty Officer Second Class: What? That’s impossible. PO3: Unless they could stabilize the dimension of timespace . . .
PO2: And create a sub-dimension that allowed them to . . . TOGETHER: leapfrog the normal time process function! PO3: But how do we stop them? PO2: Well, we could always initiate a particle deceleration field around their base. PO3: Then they wouldn’t be able to super charge the linear bypass dampers! PO2: Now we’ll just need a master code breaker! They bring this plan up to Poe who likes it so they contact Maz who tells them where they can find this master code breaker. I’m not so sure that Maz is a character that really needed to be reprise their role in this movie but we see her in a holo as she’s firing a gun at unnamed foes. Back on Ahch-To Rey suddenly wakes up and sees Kylo Ren. She immediately grabs her blaster and fires a hole in the side of her stone hut. He is not there, however, they are merely mind connected. He seems just as surprised as she is and states that she could not be doing this because the effort would kill her. This sets us up for the end of the movie. Eventually he vanishes and the tension is broken by angry Force Nuns who we suddenly learn inhabit Luke’s island. 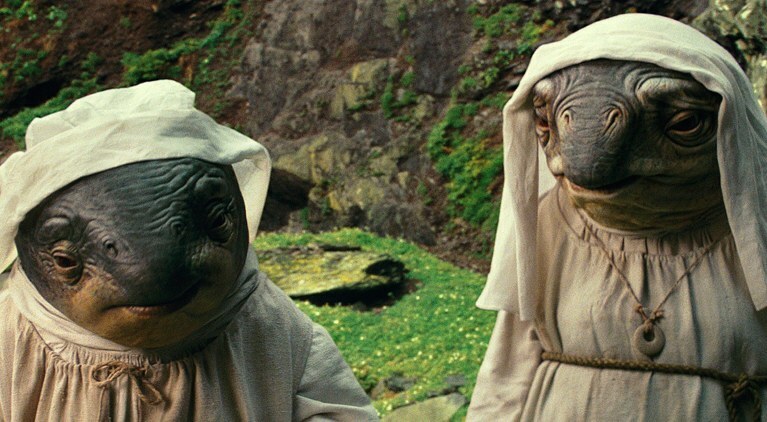 The weird milk creatures and Porgs are not Luke’s only company, there are also some very agitated Nuns. They grumble in some alien language but it is not subtitled. You have always been able to tell Star Wars’ respect for alien creatures by whether or not they are subtitled. Apparently Force Nuns didn’t make the cut. The next morning Rey is given her first lesson by Luke. He tells her to reach out, she does, and then he taunts her for being an idiot. Things quickly get out of hand as Rey tries again then immediately goes to a “dark place.” Stones rise, rocks crack, Luke yells at her to resist and then it’s all over. 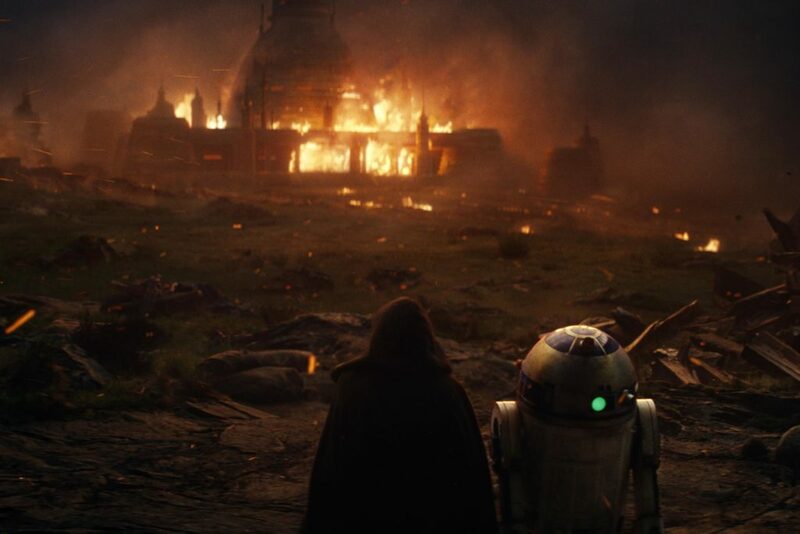 Luke says he’s only seen this once before, with Ben Solo, and that it didn’t scare him enough then but it does now. Meanwhile, back on the Millennium Falcon, Chewbacca is trying to call the Resistance while the ship is being overrun by Porgs. I really thought they were setting this up to be a Tribble Trouble sort of situation but that subplot never materializes. This segment ends with Kylo Ren telling Rey about the night that he destroyed Luke’s temple. He see a maniacal Luke drawing back his lightsaber to kill Kylo Ren and Kylo responding by somehow demolishing the temple and pushing Luke back through the wall. 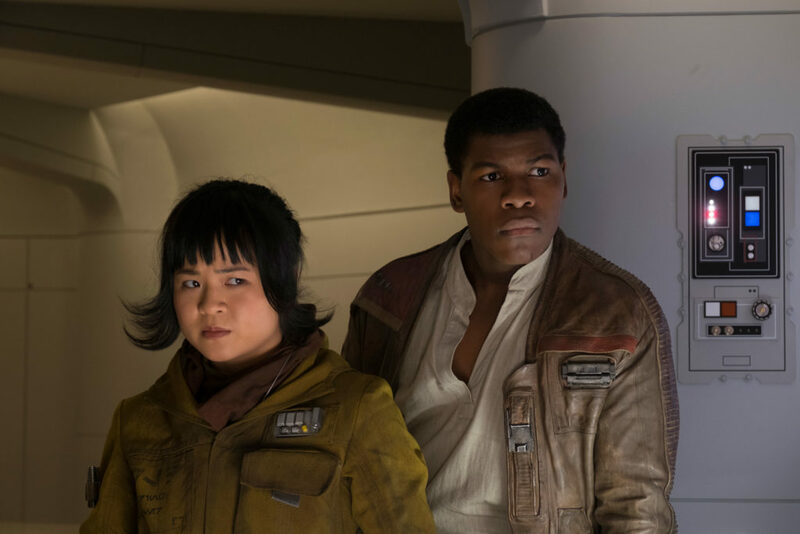 It appears that Rey is beginning to sympathize with him as she hears his story and presumably shares in some of his emotional memory of the event. Next up . . . it’s high stakes action in Monte Carlo Canto Bight!